"The Successor of the Domineer 霸业的继承者 (bà yè dè jì chéng zhě)"
The successor to Cao Cao 曹操, Cao Pi's ascension to the throne of Cao Wei 曹魏 is fraught with controversy. Cao Cao literally had a litter of male children, all of which were eligible to succession. The most promising among them were Cao Ang 曹昂, Cao Zhang 曹彰, Cao Zhi 曹植, Cao Chong 曹冲 and Cao Pi. Cao Ang was killed in action early on at the battle at Wan Cheng 宛城之战. Cao Chong was a child prodigy and reportedly Cao Cao's favorite son. This was where the controversy starts.Cao Chong died mysteriously of an illness at age 13 and it is believed that Cao Pi had something to do with it. After Cao Cao's death, Cao Zhang appeared to be planning to seize power from Cao Pi. Cao Pi promptly sent Cao Zhang back to the frontlines, far from the capital. Cao Pi then crushed many talented staff of Cao Zhi to cripple his power. He even wanted Cao Zhi executed, which led to Cao Zhi's famous "7 step poem". Ultimately, Cao Pi was two extremes of achievements: he dissolved the Han Dynasty 汉朝 became the first Emperor of Wei, yet was quite a failure both domestically and in war. 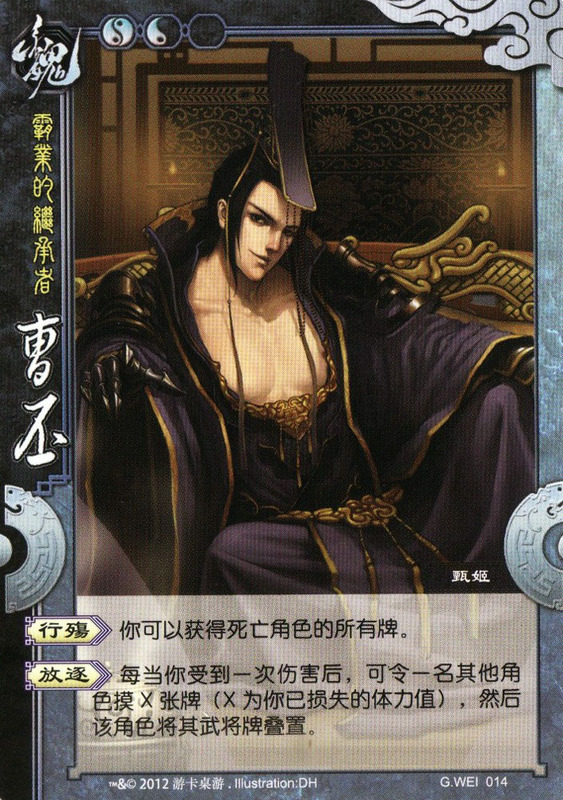 Character ability 1: "Scavenge 行殇 (xíng shāng)"
You can acquire all the cards of players that died. Character ability 2: "Banish 放逐 (fàng zhú)"
Every instance after you suffer damage, you can make another player draw X cards (X being the units of health you have lost thus far), then that player stacks/unstacks his/her character cards. The term “immediately” is removed to clarify the timing of activating “Scavenge”. The ability description of “Banish” has been changed from “flip his/her character card” to “stack/unstack your character card”. The Ruler Ability is removed. "Unnatural death" makes for interesting discussion. It definitely has link to the story, but it is not clear in which context. Many characters have died prematurely whose deaths are attributed to Cao Pi, even his own wife Zhen Ji 甄姬. This forms the basis for the game ability to take all the cards, since it implies he was the puppet master behind the scenes and their death is his advantage. However some argue that Cao Pi himself died an "unnaturally early" death at the age of 39. "Banish into Exile" is significantly mentioned in the story as Cao Pi's preferred punishment for his political opponents. His victims include his (half) brothers Cao Zhi and Cao Zhang, as well as the last Emperor of Han Dynasty. Finally, I managed to find out the true meaning of “行殇” from ZYZ#1. It was a term made up by game makers from 行觞 (drinking wine), and the character 觞 (cups for drinking wine) was replaced by 殇 (unnatural death). 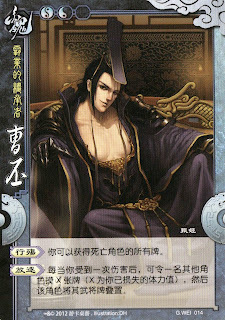 According to KayaK, this ability suited the image of Cao Pi as “the dark prince”, crawling to ascension by causing innumerable deaths. So “Scavenge” would be a good translation. To add on, Cao Pi, as well as Cao Cao, sent troops to dig graves for military expenditure, and I believed that this ability related to grave-digging.